I thought I’d kick off this week by sharing some of my colourful weekend with you. Saturday saw a long car trip to my Oma’s 85th birthday party… where we all pitched in a bought her a kindle! Another family member brought into the e-reader fold. Oma is pretty down with technology – she keeps up with all her grandkids on Facebook – so it was a perfect gift for her. For that party I broke out my bright yellow and orange tulip dress (how appropriate) worn along with some Epheriell Honey Drip Earrings and the adorable yellow typewriter brooch my friend Amanda got me for Christmas. Which reminds me, I got SO many cute things for Christmas that I am yet to show you – must get onto that! Sunday some of our friends were moving house, so my friend K (in the thoughtful pose up there) and I left the boys to it and went for a wander around South Bank. 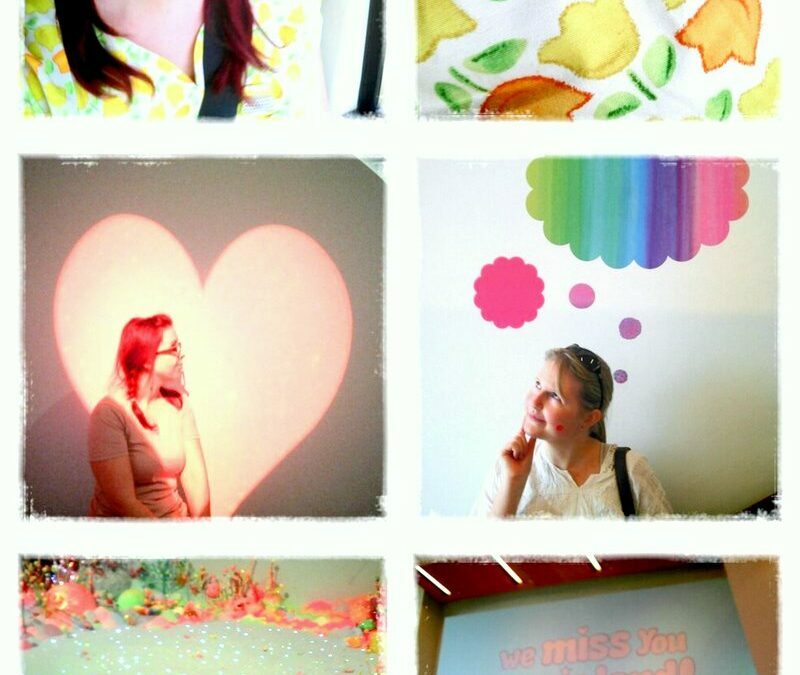 The best part of the day was our visit to GOMA (the Gallery of Modern Art here in Brissie) where two super-colourful exhibitions are currently on – Look Now, See Forever by Yayoi Kusama (featuring the famous Obliteration Room, which is where I am in the bottom photo) and We Miss You Magic Land! by Pip and Pop. What did you get up to this weekend, lovelies? P.S. I’m seriously digging plaited ponytails right now. They’re a win for warm summer days!